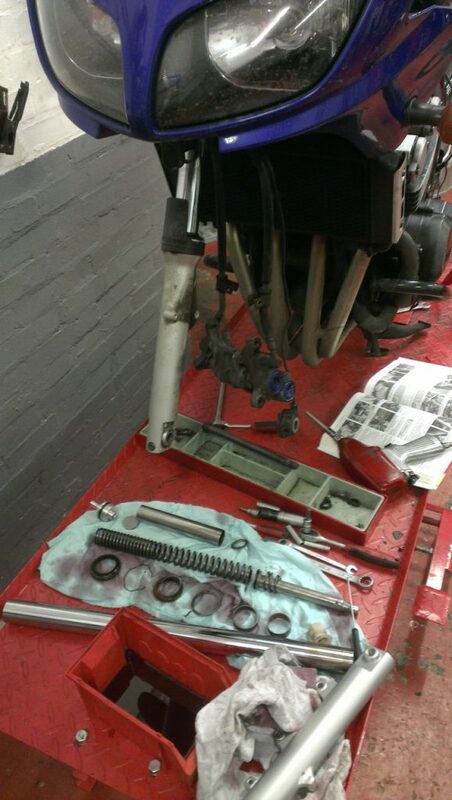 Yesterday afternoon I was down at Oval Motorcycle Centre (OMC), again, giving my forks a good service. The seals had recently gone and were leaking a lot of oil onto the stanchions and more worryingly down towards the wheel, brake discs and calipers. Not so good. Stripping the forks down is not a simple job for a newbie, however with the expert guidance of Matt at OMC, I was able to perform the majority of the work and learnt an awful lot along the way. I splashed out on genuine Yamaha oil and dust seals, after being warning away from poor quality pattern parts. New circlips also went on, as the old ones were rather rusty. Oil wise, I opted for standard spec 10w, purely to gauge what the bike is like as standard, before changing things. However many Fazer owners prefer 15w oil to firm up the front end and reduce diving.